Distance Education is formally known as an Institute of Correspondence Education. Distance Learning is the education of students who may not always be physically present in the college. 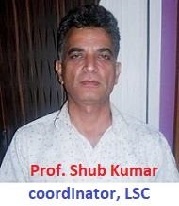 Learner Support Centre (LSC) at Govt. Degree College Kathua is affiliated to Directorate of Distance Education (DDE) University of Jammu. It was established in the campus of the college in 2002 with about 50 students. The enrolment of the students at the LSC has grown to 400 in the academic session 2016-17. 1. To provide an effective alternative path to wider opportunities in education especially higher education. 2. To provide an effective and less expensive education. 3. To provide education facilities to the people who are unable to join regular courses in the college. 4. To provide opportunities of academic pursuits to educate citizens willing to improve their qualification and standard of knowledge. With these objectives the Learner Support Centre (LSC) at Govt. Degree College Kathua provides an alternative and economical approach to the formal education system. 1. Study Material: The candidates of the LSC collect the study material from the centre after their enrollment. The study material prepared by the DDE is comprehend and is on Self Learning Material format. 2. Personal Contact Programme (PCP): 10 days PCP in each semester and 15 days PCP for BA/BCom Part II and III are organized and conducted for facilitating the enrolled students by engaging counseling staff for various subjects opted by the candidates. The LSC also provides them personal guidance and counseling. Attending the PCP is not compulsory but the students who opt Geography/Home Science have to undergo theory as well as practical classes at the LSC. 3. Internal Assessment: Internal Assessment is compulsory component of the distance education. Internal Assessment Assignment booklets are provided by the LSC. The candidates who fail to submit their assignments within the stipulated time are not eligible to sit in the external examination.